WE DIGITALLY PRINTED THE DESIGN ONTO A VINYL ADHESIVE MATERIAL WITH A SILK LAMINATE AND APPLIED TO ALUPANEL SHEETS IN SECTIONS AND JOINED THEM ALL TOGETHER WHEN INSTALLED ONTO THE MAIN. 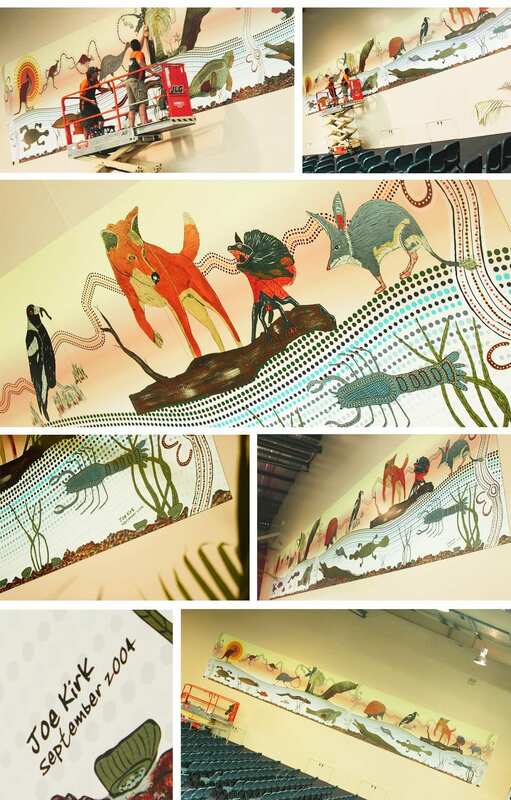 ST. EDMUND’S COLLEGE – ABORIGINAL ART PIECE RECREATED. The college needed to remove a brick wall in their current building. However this particular wall featured artwork by an Aboriginal artist called Joe Kirk from back in 2004. The college were extremely keen to keep the artwork out of respect and recreate it on a much larger scale, using it as a main featured in the school hall. This is where Surreal came in, being commissioned to recreate the artwork from photographs of the original artwork and rework with some added designs onto a mural at over 2 meters high by approx. 12 meters wide. 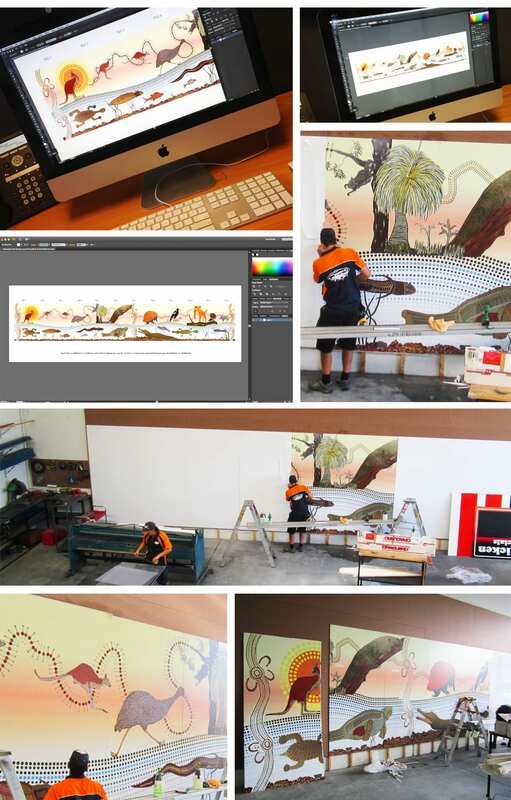 We vectorised the artwork and used a mix of enhanced scanned imagery to supply a brand new aboriginal scene of land and sea creatures from Australia. We digitally printed the design onto a vinyl adhesive material with a silk laminate and applied to alupanel sheets in sections and joined them all together when installed onto the main wall in the college. A project very different to what we’d worked on before, a real pleasure to be involved in. St Edmund’s seeks to provide the best possible education for our students in an environment which is permeated by consciousness of the presence of God and love for Christ. The College is located in Mary Street, Woodend, Ipswich and will soon celebrate 50 years “On the Hill”.